Infringe1999. 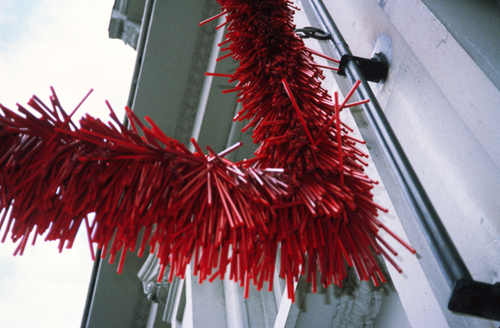 7,000 Sweetheart Drinking Straws, plastic fasteners, vinyl. 4'x8'. In collaboration with artist Susie Brandt. Infringe was a commission for the Temple Gallery’s Philadelphia Fringe Festival banner. The banner was a moveable frame, built to accept any content. Action Overlook (detail). 2002. Single channel DVD, wood, plexi-glass. Size variable. In Action Overlook, bleachers, seating intended for spectatorship, are relocated to the arena of activity — rolling on the ice rink, crated as the object on exhibit, and redirecting the art viewing to the world outside the gallery window. These three elements of Action Overlook materialize normally invisible agreements of viewership by creating a site where the activity of looking becomes the material of the art object. Carmen Into Long Division. Oak, masonite, chalkboard paint, chalk. 3’x5’, 2008. Carmen Into Long Division, an object of visual poetry, borrows a story from the artist Lin Hixson. 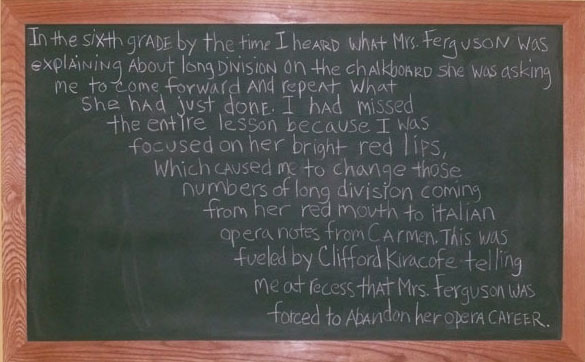 The story conjures the opportunity for daydreaming provided by long division, the mystery of the real lives of teachers, and the capacity of red red lips to transform math problems into arias. Entire school years of wonder are buried in the palimpsest of chalk on board. Directed by Gregg Bordowitz, Libretto by Gregg Bordowitz, original costume drawings by Paul Chan, costumes by Kristine Woods. Un-Express, or, Delivering Slowness as Political Ploy The letters were read aloud by the authors in Gestures of Resistance: Craft, Performance, and the Politics of Slowness, a session at the College Art Association in 2008. A audio recording of the letters was used as a component of a gallery installation at Gray Matter Gallery in Dallas,Texas the same year. Un-Express, or, Delivering Slowness as Political Ploy was an epistolary conversation wherein two artists attempted to analyze the ramifications and efficacy of the concept slowness as a strategy for resistance. Starting with four models in which slowness is a feature—Samuel Barber’s Adagio for Strings, the myth of Penelope, John Locke’s Labor Theory of Value and Chantal Ackerman’s Jeanne Dielman, 23 Quai du Commerce, 1080 Bruxelles—we engaged in a hand written dialogue using the US Postal Service as our courier. 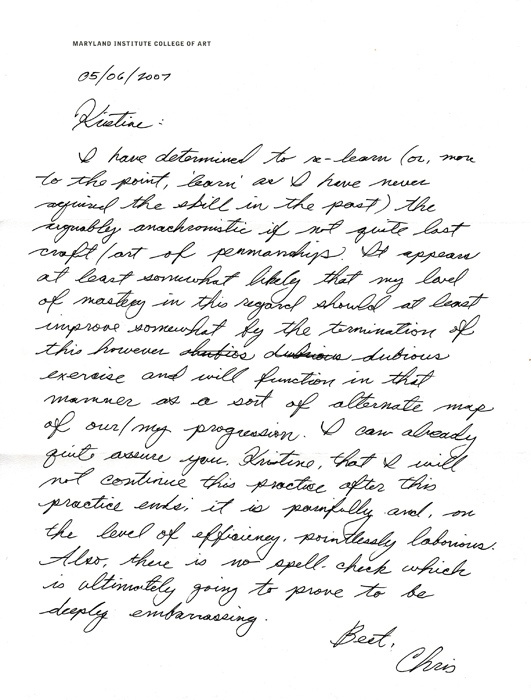 Dozens of letters were exchanged over an approximately 10 month period. The letters were read aloud by the authors in Gestures of Resistance: Craft, Performance, and the Politics of Slowness, a session at the College Art Association in 2008. An audio recording of the letters was used as a component of a gallery installation at Gray Matter Gallery in Dallas,Texas the same year. Situation Uncontainable by Architecture. hand hooked wool rug, tape. 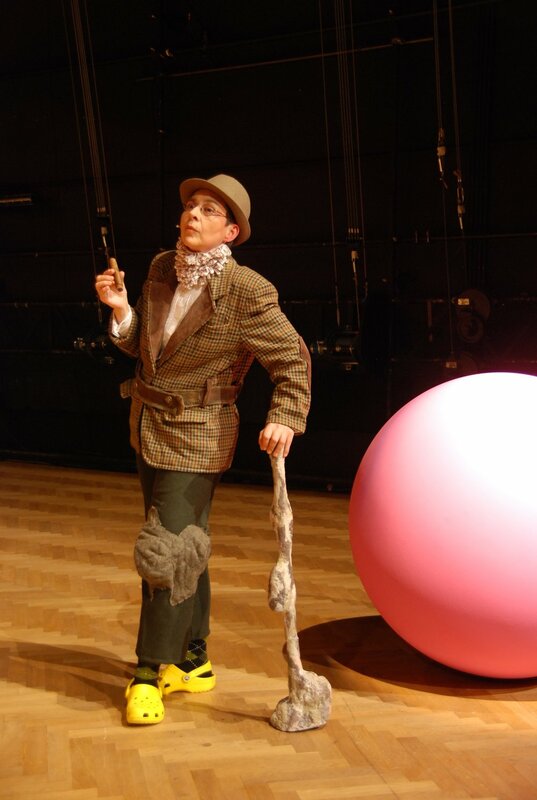 dimensions variable, 2006. In response to architect Eileen Grey’s house E.1027, where “entrez lentement” (enter slowly) is stenciled on the wall, this piece relies on flexible structures whose meaning is constituted in the moment of use. 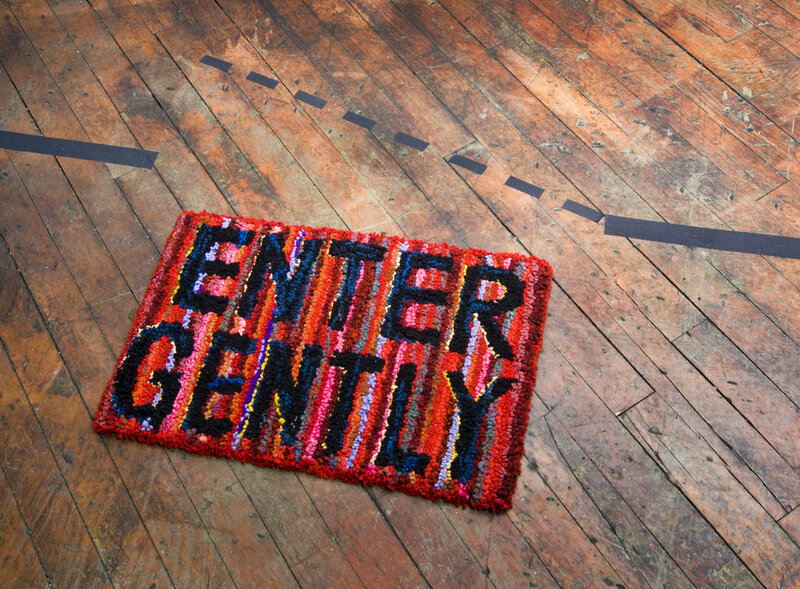 The text on the welcome mat refers both to a sexual move and a spatial move. The incongruity between the physical presence of the rug and the speculative representation of the tape drawing is confusing. Where is the location of what event? Mt. 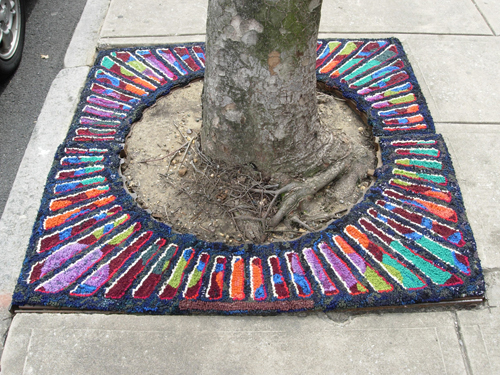 Royal Ave. (in collaboration with Susie Brandt) hand hooked wool rugs, 2005. Mt. Royal Ave. is a series of three hand-hooked wool rugs—gingham, polka dot and floral. Re-processed wool clothing was used to make traditional hand-hooked rugs, harkening back to a time before iron tree grates became common in most North American cities. Urban landscapes are characterized by post-industrial standardization, so ubiquitous it becomes invisible. Standardization promotes efficiency instituting the height, width, length, and weight of our urban lives. Commercial fabric is mass-produced, rolled onto a bolt, and sold by the yard. Standard widths— 45” or 54” or 60” —correlate with virtually every commercially produced sewing pattern sold in the world today. In the series titled Mt. Royal Ave., the anachronistic rugs are custom fit to match the standardized forms of the city block. Proposal for Viewing is a model for public sculpture that questions the agency presumed by positions of spectatorship. To use these bleachers, spectators must choose between (a) taking a seat in the conventional way, or (b) entering underneath the bleachers. Option (a) imposes a role, physically demanding a posture. Option (b) invites the viewer to re-imagine spectatorship. The viewer is invited to approach the sculpture the way children play—they can invent new uses for fixed forms. Physical Plant I & II, electrical outlet, pump, water, rag. 2001. 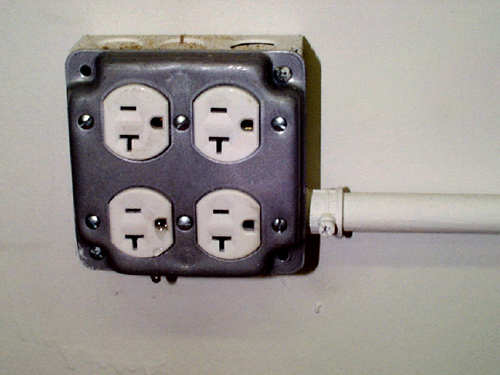 In Physical Plant, a small tube is inserted into an electrical outlet through which a steady drop of water drips onto a rag. This small change exploits the invisibility of electrical outlets introducing urgency into the architecture. Wiring becomes plumbing. This piece demands close inspection even to be seen. Living in a house requires trust that the structure is reliable. We live in a state of suspended disbelief. We have faith that things won’t fall apart, despite their slow decay. Wall 2001. Drywall, 2x4, paint, trim. 8’x10’. Wall is a stingy piece; an 8’x 10’ constructed wall with its shoe molding installed upside-down (shoe molding is an architectural detail that creates visual stability by rounding the wall plane into the plane of the floor). Inverting this detail effects a sense of wrongness that renders a perceived structural integrity unstable by its own construction. Wall. drywall, 2x4, paint, 1/2 round molding. 8’x10’, 2001. In the foreground is Rug (silk thread, dimensions variable), a companion piece to Wall. Wall is an 8’x10’ white wall with its shoe molding installed upside-down. Shoe molding is an architectural detail that creates visual stability by rounding the wall plane into the plane of the floor. Inverting this detail introduces a sense of instability so subtle that Wall can be mistaken as a pre-existing wall lacking an event—waiting for a painting to be hung on it. Rug consists of several tufts of silk pile inserted into the floor. Rather than performing the function of a rug the strands appear to be growing out of the floor. They become organic to the built environment. Usually, the rug and the wall are invisible. They hide things. In both of these pieces, decorative elements fail to competently perform their functions. Instead, they become conscious of their artifice. Trimmed Room 2000. Luan plywood, Ric rac, paint. Room size. In Trimmed Room the floor of an entire room is trimmed, much like a sewn garment, in ric rac — a complex woven textile generally relegated to the literal edge. 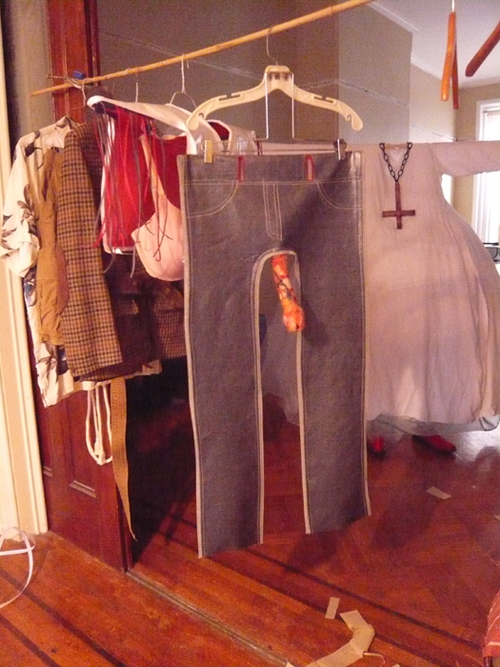 In Trimmed Room an entire room is constructed as an inquiry into gender, labor, and language. The investigation occurs through a carefully considered use of materials. Ric-Rac is a complex textile usually relegated to the edge of a garment. Here it becomes a central feature when it is compressed between luan floorboards, trimming the cracks of the entire floor. Luan is a construction-grade plywood commonly used for the unseen parts of building construction. Here it is laid down as the actual floorboards. This inversion of finish materials and construction materials holds the viewer curiously stuck between the veneer of the resolved and the rawness of the unfinished. The remaining elements of Trimmed Room, the baseboard and the window, are painted directly onto the wall surface in black. The elements in Trimmed Room are incongruous by degree: the floor and room appear correct but one subtle wrong leads the viewer to look more closely, finding that, while the construction is meticulously correct, no convention is adhered to. Nineteenth & Pine 1998. Ash. 48"x48"x 1". The wooden pieces that make this temporary textile are stored in a suitcase and can travel as a self-contained marker of the standardization of public spaces. Baltimore Erratic (in collaboration with Susie Brandt). chip bags, industrial salvage, informational plaque, 2000 feet of handmade rope. 2006. Baltimore Erratic was installed on the grounds of Evergreen House, the Italianate mansion that was the former home of the founder of the B & O railroad, in Baltimore. The sculpture is an oversized skein-in-the-landscape made from hand made rope. 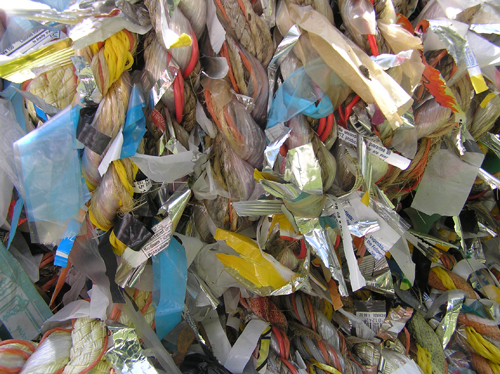 The rope is made from salvaged and recycled materials and chip bags collected in Baltimore, MD and Brooklyn, NY. The plaque is built to resemble the display panels describing glacial erratics—fragments of glacial till carried by ice and deposited on rocks of a different geologic composition. 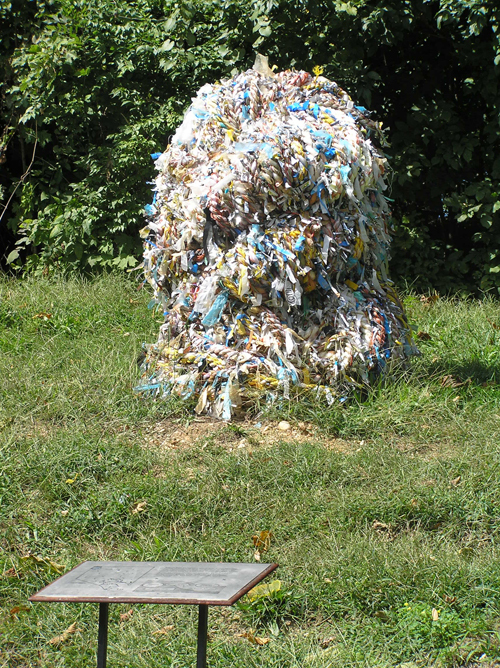 The composition of the rope sculpture is not mineral, but it’s made of detritus that collects all over the city of Baltimore. A ball of consumer culture debris, a contemporary erratic. Rag and Bone (with Susie Brandt), a project that addressed the pressing concern of post-consumer textile waste, resurrected a mobile version of historic ropewalks as a local exchange project where people participated in the transformation of their discarded textiles into exquisite lengths of hand made rope. The project was inspired by the example of itinerant workers, such as cable-splicers and knife sharpeners, plus the historical precedent of ropewalks: The 1797 Taylor-Roberts maps of New York City show a quarter mile long ropewalk on the West side of Baxter Street from Leonard to Hester Streets. Similar linear structures are documented in other port cities. Rope is common stuff. Long before rope making became a trade it was a home industry. As an extension of yarn making, rope making is spinning writ large. Rag and Bone proposed a series of temporary ropewalks coinciding, with a New York City based initiative, under the Council for the Environment, to collect and process 195,000 tons of textile waste. We proposed ropewalks at New York City Greenmarket sites and in the historic harbors of Brooklyn, NY; Baltimore, MD; and Philadelphia, PA.